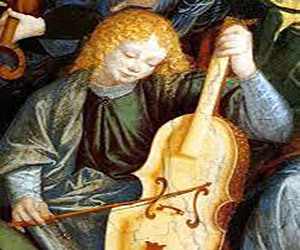 however is that there were a wide variety of different stringed instruments around in the 16th century that the modern violin and its family eventually evolved from - including the lira da braccio, a bowed stringed instrument much like the violin that was popular in the Renaissance period. The oldest surviving violin is named Charles IX, which was made by Andrea Amati in 1564, which in some respects supports the theory that Amati did indeed create the first standard modern violins, or at least provides physical evidence to justify this claim. The violin became a popular instrument in Europe with both low class and high class instrumentalists due to its small size, versatility, and its sweet, melodic tone. The violin family eventually became more popular than its close rivals the viol family because the violin instruments had an increased sound projection that was better suited to larger concert venues. During the late 18th and early 19th Century, the violin underwent some significant technical changes. The fingerboard of the violin was made longer, and it was also set at more of an angle to support the tension of the strings being increased. The increased tension of the strings, coupled with the change in the fingerboard, resulted in the violin having an increased range and sound projection. Older violins were adapted to these new specifications by luthiers (sometimes using techniques that significantly impaired the original instrument), and newly made violins were crafted using this new style. It is unknown exactly when and by whom these changes were initially made. As the popularity of the violin grew, more violins were produced and the violin was adopted into many different styles of music. Violin players developed new playing techniques to complement new genres, and the violin was sometimes modified slightly to fit the needs of the new genre. The violin became a key instrument used to play traditional songs in Celtic, Irish, gypsy, and Hungarian music, and was later used to play country/western, bluegrass, blues and jazz as these genres emerged over time. The violin is now one of the most popular instruments in the world. Old violins tend to be sought after over mass produced factory violins by intermediate and advanced players because of their superior craftsmanship, resonance, and because the tone and timbre of the violin is thought to mature over the lifetime of the instrument. The most famous violin maker is the 'Golden Age' luthier Antonio Stradivari, whose violins now sell for millions of dollars. Violins that are made today can produce sound electronically by using amplifiers and microphones, eliminating the need for a sound box. Fully electric sound produced by violins can be distorted through amplifier settings to create different tonal qualities altogether - further diversifying the capabilities of the instrument. The violin has ultimately evolved to be a very versatile instrument, and a violinist now has numerous career options and genres to explore. While violins may be famed for their classical origins, there are many amazing blues, Celtic, country, bluegrass and popular violin players flourishing in these different musical environments- which is one of the many reasons why the violin is such an exciting instrument to learn!